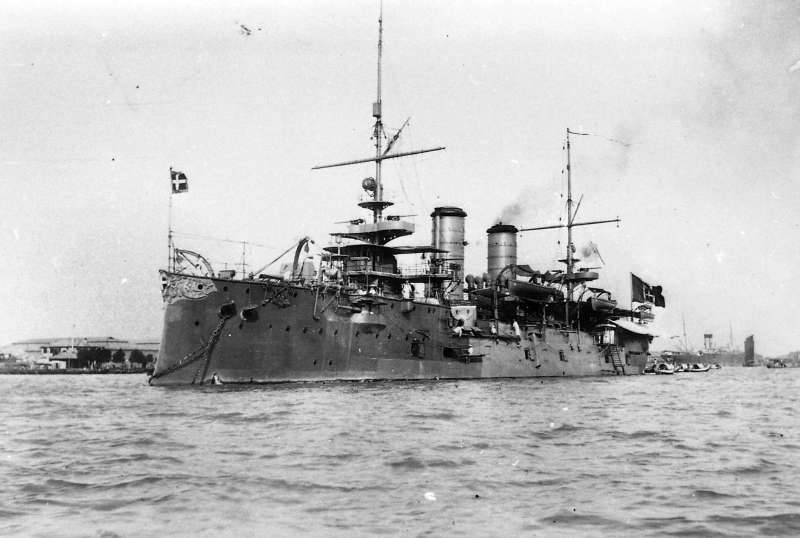 The Marco Polo was the first Italian armoured cruiser. She was designed by chief engineer Carlo Vigna in 1889, and laid down in January 1890 in Castellamare di Stabia but was closely based on the Etna class cruisers. She was modified during construction as an armored cruiser she was larger and theoretically faster, but without the heavy 254 mm artillery pieces of the Etna. Instead, her 152 mm pieces were complemented by a large 120 mm battery. But this choice led to several criticisms, and the Marco Polo was generally considered too lightly armed. In addition, her expected speed of 19 knots was never reached and remained as slow as the Etna. The ships was longer than the Etna at 106.05 meters (347 ft 11 in) overall versus 283 ft 6 in (86.4 m), wider at 14.67 m (48 ft 2 in) vs 13 m (42 ft 6 in), and the draft was deeper for about 8cm. Overall displacement was 4,583 t (4,511 long tons), much heavier than the Etna class at 3,474 long tons (3,530 t). Propulsion used two vertical triple-expansion steam engines fed by four Scotch marine boilers which produced 10,000 indicated horsepower (7,500 kW) versus 7,480 ihp (5,580 kW). Consequently top speed was rated (in theory) as much as 19 knots versus 17 which was a real progress, but in reality 17.2 knots was the most common figure, as she did 17.8 knots (33.0 km/h; 20.5 mph) at best by overheating its boilers and producing 10,663 ihp (7,951 kW). Radius was 5,800 nautical miles (10,700 km; 6,700 mi) versus 5,000 nautical miles (9,300 km; 5,800 mi) at 10 knots. The armament seen the deletion of the heavy 254 mm pieces in favor of a concentrated battery of six 152 mm/40 (6.0 in) guns in single mounts which the Etna had already, for a secondary battery of ten rapid-firing single 120 mm (4.7 in) guns. The light battery was about the same, eleven 57 and 37 mm versus ten Hotchkiss revolver guns on the Etna. Its 100 mm (3.9 in) armored belt only stretched to the middle of the ship, starting and ending under the fore and aft ammunition wells. Gun shields and conning tower were protected by 51 mm of armour. Only the deck was protected on the Etna at 1.5-inch (38 mm). 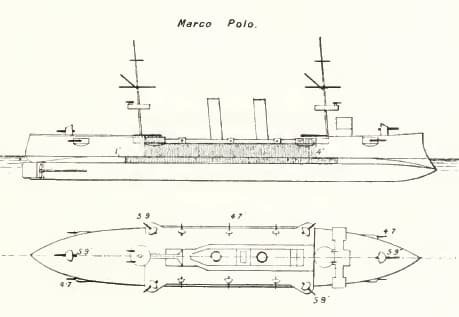 Marco Polo was launched on the Royal Shipyard in Castellammare di Stabia on 27 October 1892, entering service on 21 July 1894, four years after being laid down. Her first long trip was Greece in 1897, but she departed the next year for the Far East on 26 January, visiting through the Yang Tse Nanking, Hankow, Shanghai, then Japan and back to Shanghai. She was back to Naples on 20 October 1899 and then returned to China. On her way back in 1907 she visited Zanzibar, Mogadishu, and Massawa in Eritrea before arriving at Taranto. She stays there until armament modification in 1911. 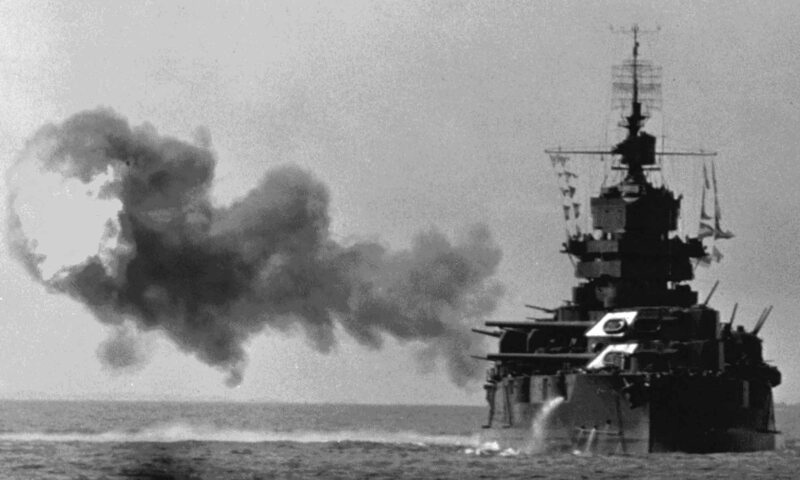 She was partially disarmed: She kept six 152-mm pieces (in a classic lozenge arrangement, one on the forecastle, another on the back, and the other four on the flanks in open casemate. ), sacrificing six 120 mm guns out of the original ten, six 57 mm pieces out of nine, and four TTs out of five. Then she was affected to the 2nd Division of the 1st Squadron of the Mediterranean Fleet, soon placed under the Duca di Abruzzi command, she patrolled to spot Ottoman Ships. 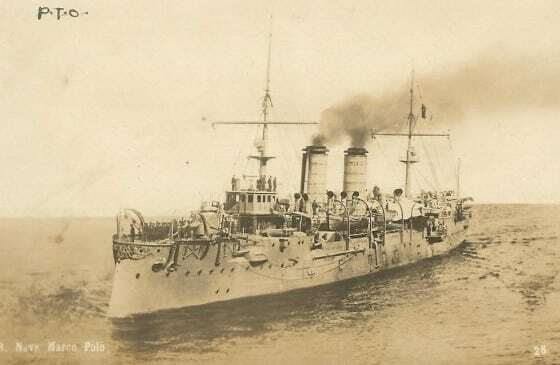 She stopped an Austro-Hungarian ship on 5 October 1911 off San Giovanni di Medua, and the boat sent to board her was quickly fired upon by an Ottoman coastal artillery. Marco Polo replied for 45 minutes and silenced the battery, but this triggered a diplomatic tempest. She was then affected to the 4th Division of the 2nd Squadron operating off Libya and later she shelled Homs in support to Italian landings and later on April 1912 together with Carlo Alberto, shelled Zuara. She made later a sortie with the 4th Division against the Ottoman fleet in the Aegean Sea, but never found it. By default she and other ships bombarded the entrance to the Dardanelles on 18 April. She was later back in Libya, and later helped to capture Misrata. On 25 February 1913 she returned to the Far East, visited Kobe in August 1914, was back to Shanghai in December, was later sent in Yemen and returned to Naples in March 1915. By then she was considered obsolete. She did participated in the great war but as an accommodation ship at Venice and was taken in hand in 1917 for a conversion into troop transport, the Cortelazzo, armed in supplement with two howitzer and two heavy mortars. In October 1920 she was renamed Europa, put into reserve, then reactivated in 1921 under the name of Volta, and again placed in reserved, and finally written off and sold for scrap in 1922.